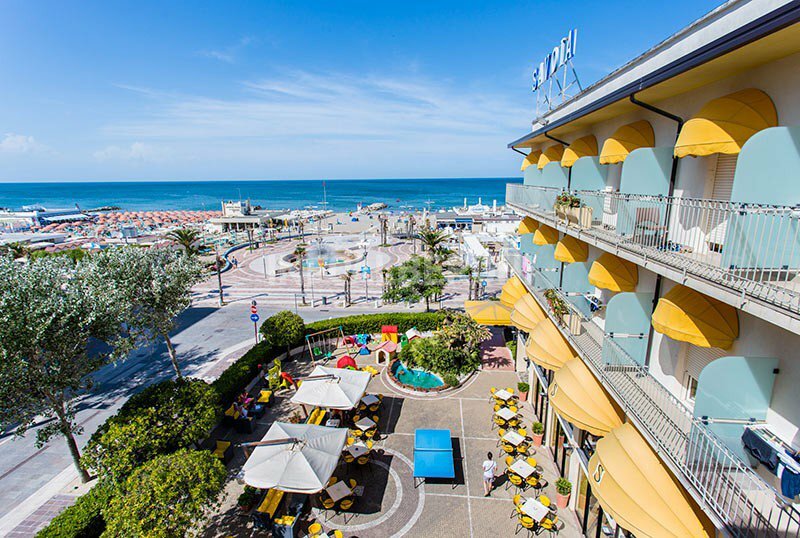 The Hotel Savoia is a family-run three-star hotel in Misano Adriatico, situated on the seafront in a very central position. It is surrounded by a large garden with a play corner and has parking, free WI-FI connection throughout the entire hotel and services for children. Small pets allowed. The hotel is located in Misano Adriatico, facing the sea and overlooking the pedestrian center of the city. The Misano railway station can be reached on foot in less than 5 minutes. The rooms are all equipped with balcony with sea or internal view, air conditioning, WI-FI, safe, telephone, digital terrestrial TV and bathroom with shower box, hairdryer and courtesy set. The rooms are available in two types: Relax and Comfort. On request: rooms facing the sea. FAMILIES: it is possible to request connecting rooms. Garden equipped with tables, chairs and children's playground area, hall with TV, bar area, reading room, lift, luggage storage and night porter. The staff organizes theme nights. PARKING: uncovered and free, available for all customers. AIR CONDITIONING: free and available both in the common areas and in the room. LUNCH AND DINNER: the kitchen provides every day a double choice menu of meat and fish with homemade pasta and dishes from Romagna. Water and wine are included at meals choosing the all-inclusive formula. CHANGES: the menu is also suitable for vegetarians. In the hotel: indoor and outdoor playground area, strollers and entertainment. Pediatric counseling is available upon request. At meals: high chairs at the table, kitchenette and baby menu. The list prices are per person per day for a min. 3 nights in full board. STAY TAX: € 1.00 per person per day. - Meals not consumed will be counted as well. - 24-hour medical assistance available for a fee.